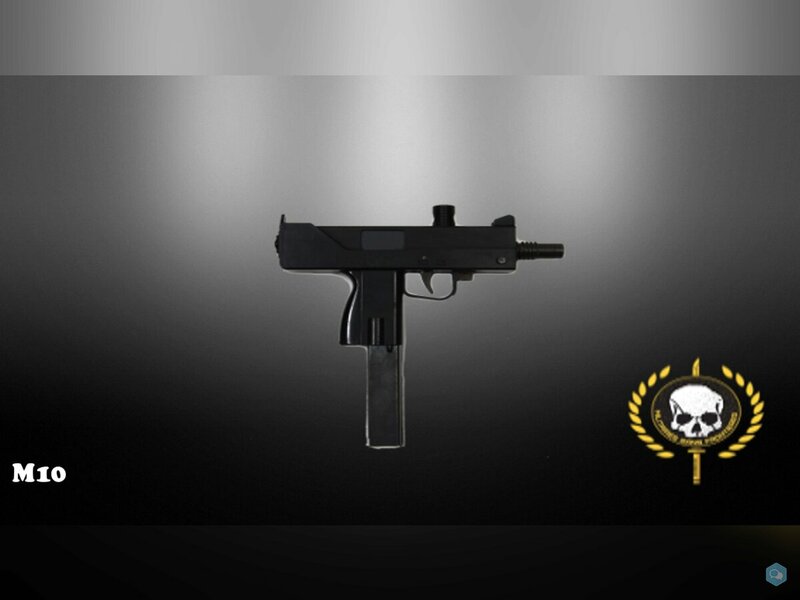 The Military Armament Corporation Model 10, officially abbreviated as "M10" and "M-10", and more commonly known as the MAC-10, is a compact, blowback operated machine pistol that was developed by Gordon B. Ingram in 1964. It is chambered in either .45 ACP or 9mm. 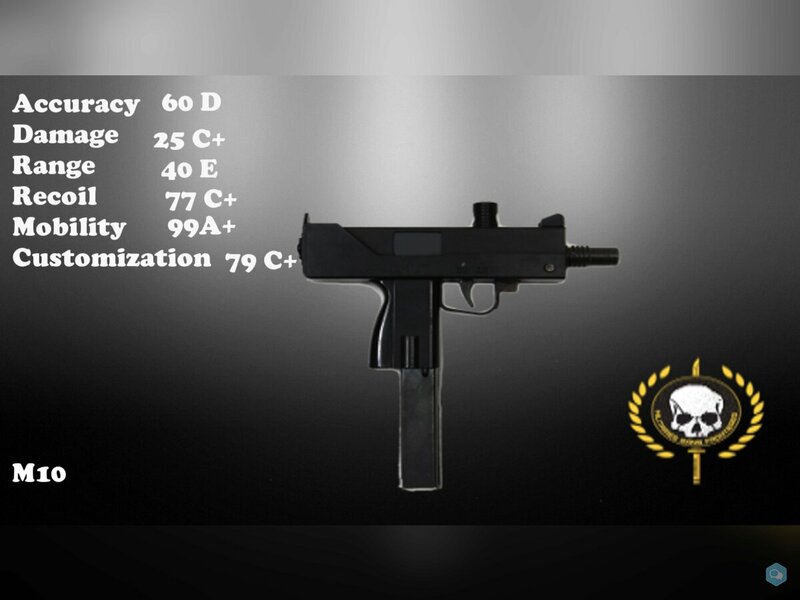 A two-stage suppressor by Sionics was designed for the MAC-10, which not only abated the noise created, but made it easier to control on full automatic (although it also made the gun far less compact and concealable)The M10 was built predominantly from steel stampings. A notched cocking handle protrudes from the top of the receiver, and by turning the handle 90° would lock the bolt, and act as an indicator the weapon is unable to fire. The M10 has a telescoping bolt, which wraps around the rear face of the barrel. This allows a more compact weapon and balances the weight of the weapon over the pistol grip, where the magazine is located. The M10 fires from an open bolt, and the light weight of the bolt results in a rapid rate of fire. In addition, this design incorporates a built in feed ramp as part of the trigger guard (a new concept at the time) and to save on cost the magazine was recycled from the M3 Grease Gun. The barrel is threaded to accept a suppressor, which worked by reducing the discharge's sound, without attempting to reduce the velocity of the bullet. This worked well with the .45 ACP versions, as most loads are subsonic already, as opposed to special, low-powered subsonic loads usually required for suppressed 9mm weapons. At the suggestion of the United States Army, the suppressor also acted as a foregrip to inhibit muzzle rise when fired. Ingram added a small bracket with a small strap beneath the muzzle to aid in controlling recoil.